So-called lofty ideas like "bridging cultures" and "fostering global understanding" all really come down to one basic, relatively small, thing: commonality. Find the common ground, and you've got the seeds from which humanity sprouts. University of Hawaii at Manoa ceramics professor and artist Suzanne Wolfe knows this simple formula, and has proven that it works. For her, the commonality is clay, and the common ground is the UH Department of Arts' ceramics facility. There, 17 ceramists from around the world are participating in the "East-West Ceramics Collaboration III," a monthlong event that includes daily workshops, slide presentations and an open house, all open to the public. It's a forum from which participants share and learn about each other and their craft. "The collaborations bring the artists together for a long time  longer than any other situation  and in a relatively large group," Wolfe said. "Strong friendships and relationships are formed, simply because spending that period of time together, in such an intense environment, naturally fosters a close relationship. "Everyone is focused on the same goal, even though the means to the end is often different." Exchanges occur at many levels, weaving together craft, culture and technique, Wolfe said. Ideology and culture are a regular topic as the artists work side by side and collaboratively. And while such dialogue usually goes beyond ceramics practice, "these broader discussions help to illuminate ... each person's way of working with clay," Wolfe said. "Technically there is always a lot of sharing," she continued. One vivid example took place at the first collaboration in 1995. "The Korean artist Yikyung Kim asked one of the Korean ceramics students to show the rest of the group how to do the Korean foot-wedging technique. This is a technique that allows one to mix a large amount of clay with minimum effort, by wedging with the feet a huge mound of clay. The technique uses both finesse and the weight of the whole body, extended through the foot, to mix the clay. There was a wild afternoon where the Korean student taught two students from Michigan this technique." 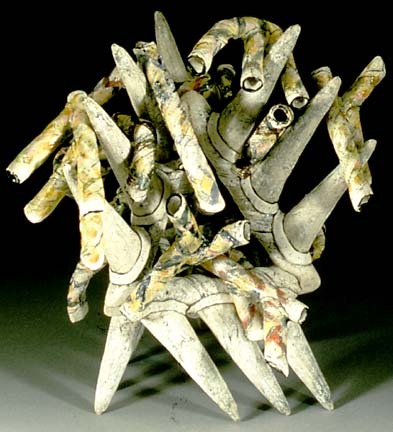 Georgette Zirbes, of the United States, and Martin Mohwald, of Germany, are participating in "East-West Ceramics Collaboration III." Zirbe's "Eeecks," above, is from 1998. 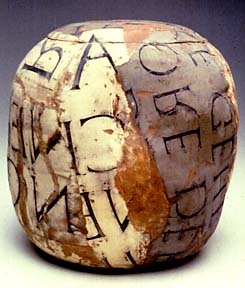 Mohwald's "Jar" is earthenware. Sometimes, the sharing between artists literally shows up in the art. "The overglaze enamel tradition (seems to be) much more in use in Asian ceramics than in Western," Wolfe said. In 1998, during the second collaboration, visiting artist Kyoko Tanabe "spent a week grinding enamels. Everyone was really intrigued, and wondered if she would ever begin working on her pieces." She was working in the same room as Paul Mathieu, a Canadian artist, and offered him the use of her overglazes, which he used to embellish the surfaces of two of his teapots. "It was a technique he had never used before," Wolfe said. PROFESSIONAL ARTISTS are not the only ones who reap the benefits of the collaboration. UH students, acting as helpers, get close to goings-on. "They assist with kiln loading and firing, clay mixing and other tasks. They come along on outings and do their own work in the lab during the workshop," Wolfe said. "They are exposed to a diversity of techniques, styles, and concepts in a way that they would never experience in the kind of short workshop situation that is usually the norm. "The students have always been extraordinarily influenced in their work by this experience. They also are put into a situation which gives them an understanding of what, as a professional ceramics artist, or artist in general, it means to be totally dedicated to your work, and totally involved in a project or production. To be involved in this kind of experience is a revelation for many of them." The students' work from the collaboration will be exhibited in the University of Hawaii Art Gallery's Commons Gallery during the first week of the invited artists' exhibit, which will be held in the Main Gallery Sept. 1 to 27. WOLFE BEGAN the collaborations in 1995 after a friend spoke about workshops she attended in Eastern Europe. "That gave me the idea that Hawaii is such an ideal place, both geographically and culturally, for a workshop that stressed the East-West connection," she said. In 1995, when Wolfe invited six professional ceramic artists and several of their best students to work together in the studio, the first collaboration workshop was born. In 1998, she organized the second workshop by inviting seven professionals to participate. Each brought with them an emerging artist who had recently graduated. This year's event brings together 17 professionals. 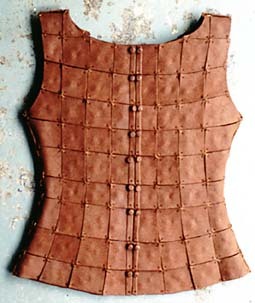 Fiona Wong of Hong Kong created "Vest" out of terracotta. "I think that the geographical location and the exigencies of history make Hawaii ... the multicultural environment which accepts and nurtures diversities in ideas, ways of living, traditional practices, and so on. This diversity creates a natural ground for international interaction," Wolfe said. The collaborations have indeed been fruitful in cultivating international ties, as new projects and alliances continue to blossom from the connections made in Hawaii. "Four women artists from the 1998 collaboration have formed a loose kind of association," Wolfe said. "The goal is to figure out how we can work together. Our first project is called "Space Between," which also involves our students. It's an ongoing project that explores the similarities and differences between our four places  Germany, Michigan, Australia and Hawaii." Another project will take 10 UH students to Korea, where they will work alongside 10 of their Korean peers for three weeks. The union will be a result of Korean ceramic artist Inchin Lee's attendance at the 1998 collaboration. The workshops that year also resulted in a trip to China for Wolfe and some of her students. They visited Yixing, where they worked in a factory where one of the participating artists was based. Another student is currently doing graduate work in Canberra after meeting an Australian artist during the 1998 collaboration. AFTER 31 YEARS at the university, Wolfe will be retiring soon. She hopes to help someone else continue the program she believes is invaluable. "It is an excellent experience for the artists, for our students, for the local ceramics community," she said. "The news of these collaborations has been spreading. I hope they will serve as a model for other kinds of activities. I also hope they will enhance the reputation of our university. "My greatest desire, though, is that people who come to see what is going on ... learn something new, and have doors and ideas opened to them that would never have happened otherwise. That is the greatest benefit." All events are free. Call Suzanne Wolfe at 956-5264 for information. Also: An exhibtion of student work produced during the collaboration will be shown in the Commons Gallery.